Three decades ago, New York City-based ‘super collector’ Stephan Loewentheil started acquiring early photographs of China. Now, the Loewentheil China Photography Collection counts more than 15,000 shots dating from the 1850s through the 1930s, making it one of the largest private archives of early China photography. Loewentheil is also a leading dealer of rare books and manuscripts with major international clients. Founder and president of the 19th Century Rare Book and Photograph Shop, over the past 30 years he has handled unique pieces like the original manuscript of Darwin’s On the Origin of Species and Shakespeare’s first folio. Still, it was the historical value of early photographs of China that most motivated him to go about assembling his most important collection to date. Indeed, Loewentheil’s photographs are more than just some of the earliest recorded forms of paper photography in China – they are living historical documents. 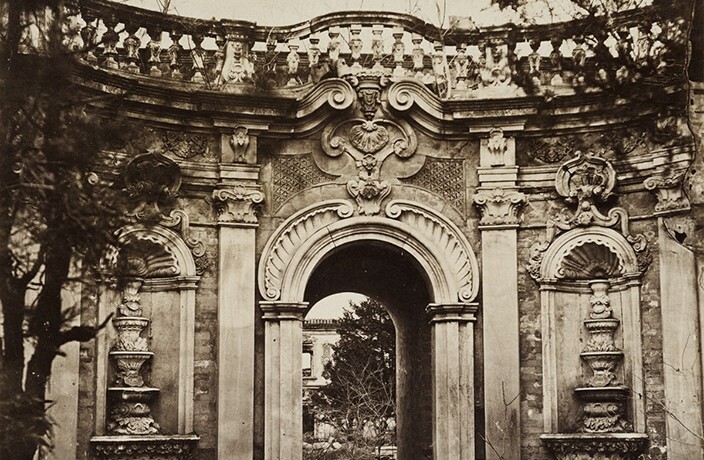 Thomas Child’s photograph of the Yuanming Yuan’s Fountain’s Gate, for instance, is one of the few that allow us to appreciate the beauty of what is known today as the ‘Old Summer Palace,’ now not much more than a collection of ruins located in the northwest of Beijing. Despite their value, it seems that these early photographs of old China are still in the process of finding their place in the country’s artistic discourse. “Unfortunately, there is yet no permanent public museum collections in China where people can view the great heritage of early Chinese photographic art,” says Loewentheil. This made the 2018 exhibition Vision and Reflection: Photographs of China in the 19th Century from the Loewentheil Collection, curated by Philip Prodger and hosted by the young Tsinghua University Art Museum from November through last month, even more groundbreaking. "Photography preserved through art images of that vanished world and documented the transformation of the diverse lands of 19th Century China into the great modern nation it has become." Marking the first time that part of the impressive Loewentheil collection was made available to Chinese audiences, the exhibition focused on presenting photography as “a documentary tool and a way for human beings to understand themselves,” as Su Dan, vice director of the Tsinghua University Art Museum, underlines in his introduction to the exhibition. It was also an occasion to discuss the spread of photographic arts in China. Among the 120 pictures shown at Tsinghua University, all in a surprisingly good state of conservation, were some from pioneers of Chinese photography like Lai Afong from Hong Kong and Liang Shitai from Tianjin. These early photographers are credited not only with mastering a new technique, but also for popularizing it among a climate of discomfort towards this new technology. They had to first popularize the practice among the elite in order to then proceed to introduce it among merchants and common people. This is why Loewentheil’s collection also includes portraits of great historical value, including some of Empress Dowager Cixi and of late-Qing high-ranking official Li Hongzhang. Since the late 19th century, their works represented an important form of cultural exchange between China and the rest of the world, allowing for the appreciation of the artistic significance of Chinese photography. Also, pictures from Chinese and non-Chinese photographers show differing aesthetic stances. For example, Chinese photographers created portraits with compositions similar to those of paintings, while western photographers attempted to seize the movements of sitters. With regard to architectural photography, Chinese photographic studios were inclined to include architecture into landscapes while western photographers focused more on the architecture itself. Scottish photographer John Thomson was one of the first to travel to the Far East and use the new medium to document the people, landscapes and artefacts he got in touch with. His collection Foochow and the River Min (1873), realized during his five-year stay in China, contains landscapes from the city of Fuzhou, in Fujian province, and is universally celebrated as one of the greatest works of early photography. "This is one of the most famous photographs ever made in 19th-century China. The temple, which still exists, is shown in mirror reflection on the calm minimal surface of the river, against a bright sky. It almost doesn’t look photographic; rather, the sky and river look more like the raw silk or paper of a traditional brush painting. The overall effect is of the temple suspended in space, levitating, an object of contemplation and meditation." An Instagram love story moves to Shanghai: SymmetryBreakfast's Michael Zee chats with us about his morning rituals with the love of his life. We scaled China's highest vantage points with some of Shanghai's most prolific rooftoppers on Instagram. The Tokyo-based photographer sees Shanghai in a new light. Here are this year's winners for the YKL Photography Project competition, held in partnership with CNCREATE.